Unlike many of us, however, this particular woman wrote an intense (and somewhat creepy) open letter on Craigslist hoping to find that out. From the tone and level of detail, it's clear to see that she AIN'T PLAYIN'. 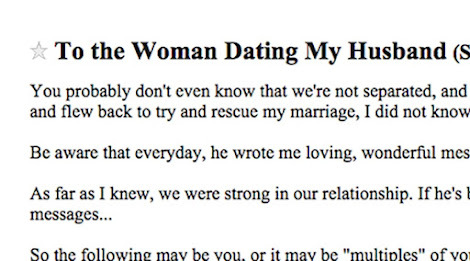 She then proceeds to list all the red flags that clued her in to her husband's cheating ways. You left your mascara in my husband's old vehicle (he bought a newer one in late September). It was a shimmery brown Covergirl. Your bag of clothes that you washed inside out: He tried to stop me from throwing some women's and children's clothes away that I found in a bag in the garage, claiming they belonged to our friend M's nephew... (there were some boys clothes, some small girl's clothing, and woman's... so I call BS on that! btw....Nice tastes in shirts. I like Ralph Lauren plaid, too, but you appear to be a bit bigger than me....) he glummly shut up when I cheerily reminded him that M's nephew has grown, so any of the clothes would be out grown. ...recently he's lost weight, quit drinking (that was 15 years of h*ll for me and the kids) bought himself a NEW truck (without consulting / asking me). She even anticipates how the mistress(es) in question might be trying to rationalize the situation, and SHUTS IT DOWN. She also paints a vivid picture of what life will be like for the person, should they decide to make a life with her sloppy seconds. ...guess what? That nice house and property you saw, and new truck, and all his new tools? ***I OWN HALF OF ALL OF IT***. You, my dear, are the proud new doormat for a middle-aged man who has been a contractor-type all his life. He's fairly smart though, but at 56 his body will not hold out much longer, and he's doesn't have a wide skill-set. Don't marry him. If you do, then HALF OF YOUR STUFF IS HIS! He'll use you up, he's a selfish lover, he's a spend-a-holic, and it's likely he'll revert to booze...His family will hate you (they're weird, you'll see), and he has a tendency to do incredibly stupid stuff. If you're a real, actually nice person, that has been duped, just know that he's gotten very good at lying. He's a lot of fun. He's a great cook, and a great talker...And he's not single, he's just trying to get laid. Or worse. He's courting you as the next Mrs., knowing that our divorce will leave him very, very financially screwed. And you, my dear, are lookin' to him like his life boat. Get out while you can. 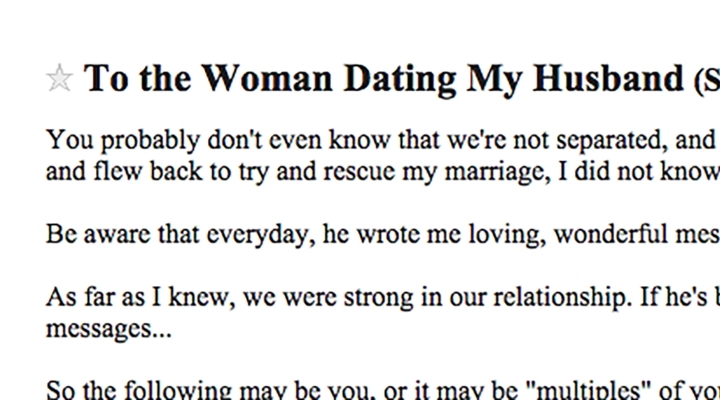 You have been warned, Woman Who Is Dating Her Husband. Better get outta Dodge.